Q. Do I need a visa to enter Ireland? A. Residents of many countries do not need a visa to enter Ireland. This website lists the countries from which, if you are a passport holder, you do not need a visa. Q. Will I be met at the airport upon arrival in Dublin? A. The cost of the airport pickup is not included in your tour cost, but we can make arrangements for you or you can take a taxi or bus on your own. Please check with our Client Liaison for the cost of the airport pickup. Note that cost is based on the number of people so if you will be arriving at the same time as others, the cost will be less than if you were by yourself. Q. What’s the best airline to take and best way to fly into Ireland? A. Usually people book their flights based on price and loyalty programs. Cost will be different depending on where you are flying from. In any case, note that this tour starts in Dublin and ends in Shannon so you’ll probably want to book your tickets into Dublin and out of Shannon. There’s an outside chance that it will be cheaper to fly round trip to Dublin. (see next question for how to return to Dublin after the tour). Q. If I book my tickets round trip from Dublin, how can I get from Shannon to Dublin at the end of the tour? A. The most convenient way for you to get from Shannon to Dublin is to let us book a private driver and vehicle for you. There are usually several people who choose this option which brings the cost down and often makes it cheaper than other options. 1) Take the bus from Shannon Airport to Limerick Bus Station and change there for a connecting Expressway bus to Dublin Airport. 2) Take the bus from Shannon Airport to Limerick Train Station and get a train to Dublin Heuston Station from where you would need to get a bus or taxi out to the airport or to your hotel. 3) Take a taxi or a private transfer from Dromoland or Shannon to Limerick to get the train/bus to Dublin. Here is a website to compare the costs for train and bus. A. Ireland’s food scene has changed a lot over the years and there is much more variety and higher quality food available now than ever before. In addition to the typical Irish food that you won’t want to miss, there will be lots of international options available. If you have special dietary needs or preferences, expect to be flexible. Those who are gluten-free may find some options but vegetarians likely won’t find much tofu, tempeh or protein beyond meat and fish. Expect to find lots of tea and coffee available but if you are a decaf drinker, consider bringing decaf Starbucks VIA or your own tea bags as decaf can be more difficult to find. A. While bottled water will be available, we strongly urge our tour participants to carry their own reusable water bottle and fill your bottle at the hotel and at restaurants so as to cut down on the number of plastic water bottles that get thrown out daily in Ireland. A. There’s nothing you need specifically for Ireland. However, you’ll want to consult with a travel doctor for medical advice. A. While you will be more comfortable moving around with fewer bags, you likely won’t be the only one with checked luggage. For international flights, note that some airlines have a strict weight limit for carry-on bags so even if you have a small bag, you may be required to check it due to its weight. And if you have any additional flights within Europe that are booked on low-cost carriers, they may have weight restrictions for carry-on and checked luggage and may charge a premium if your luggage is over their weight limit. A. You’ll receive a full packing list for the tour that will help guide you. You will not need any dress clothes per se as we will not being going out anywhere that would require them. Lightweight travel pants, tops, dresses and/or skirts will be most comfortable. Our rule of thumb is not to bring more than two pairs of shoes–one pair for walking and perhaps a pair of sandals, tennis shoes or small boots (depending on the weather forecast). The weather in October can be unpredictable. We may have beautiful sunny warm days or we may have grey, cool and rainy days. The evenings could get quite chilly. It’s best to prepare for the worst and plan on bringing layers so that if/when it warms up during the day, you can wear your warmer weather clothes. We’ll be on the Aran Islands for a couple of days and they are notoriously rainy and cool (but oh so beautiful!!). Before you arrive there, you may already have found a lovely Aran-island made sweater to buy. Q. Will we bring our luggage to the Aran Islands? A. We will be spending two nights on the Aran island of Inis Oirr. We will leave our big bags secured with our driver and only take an overnight bag for this trip. Please bring a duffel or small portable bag with a change of clothes for these days. A. We encourage you to pack light and do hand laundry along the way. You may then purchase a bag (or use your duffel from the Aran islands!) once-in country to bring home souvenirs. A. Definitely bring a lightweight raincoat. One that is lightweight will pack down relatively small and allow you to wear it on warm and cold days. A. Hair dryers should be available at all of the accommodations with the possible exception of the BnBs on Inis Oirr. There we may or may not have hair dryers in our rooms. Q. Is WiFi available at the hotels? A. Expect WiFi (usually complementary) at all of our accommodations with the exception of the BnBs on Inis Oirr. There we may or may not have internet. A. 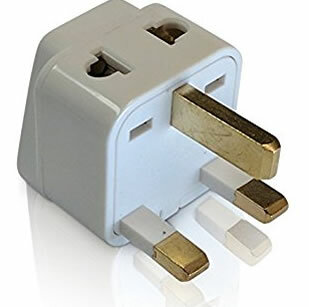 You will need a converter for any devices unable to handle 220 (hair dryer, curling iron, etc.). Most electronics these days (such as a laptop and iPad) have a built-in converter that protects the device from power surges. Q. Can I use my cell phone in Ireland? A. There are a few ways you can use your cell phone in Ireland. First, consider buying an international data plan from your provider. Most providers offer an international data plan where you purchase a certain amount of data and have a month to use it. You can use it for maps, internet, phone, texting, apps, etc. Second, you can simply turn your data roaming off and only use your phone when there’s WiFi. If you require regular access to the internet, you could purchase a hotspot such as a Solis Skyroam where you’ll have your own personal WiFi connection. A. There will definitely be ATMs available throughout the trip. You’ll want to let your bank know in advance that you are traveling so they don’t deny usage of your card thinking it’s a fraudulent charge. You’ll also want to find out what, if anything, your bank changes for international ATM withdrawals. If it’s based on each transaction, you’ll want to take larger amounts of money out rather than making numerous small withdrawals so as to limit the charges. Q. What’s the currency used in Ireland? A. Euros are used in Ireland. Consider downloading an app such as Converter so that you have quick access to the exchange rate. A. We get this question a lot, and it really does depend on your spending habits. Because you’ll have relatively easy access to cash through ATMs and you can make purchases using a debit or credit card, you likely won’t need much cash in hand. Having said that, bringing some small bills to tip a taxi driver or bellman upon your arrival and before you’ve had a chance to change money might be helpful. A. While Ireland is a safe country, there are opportunistic thieves everywhere looking for a way to separate you from your cash. You might consider carrying your passport, credit/debit cards and cash in something like a neck pouch or a large wallet like this one from Baggallini. You could then put that in a larger cross-body bag. A. The majority of tips for the driver/guide and any other guides we have are covered under your trip cost. Having said that, small tips for your waiter and for our driver/guide would be appreciated if they’ve gone above and beyond your expectations. Q. Do you suggest we bring gifts for the locals? A. It’s certainly a nice gesture (but not necessary) if you have small gifts to leave with friends you make along the way. Things that might be appropriate include souvenirs from your home town including items with logos (Seattle mugs or baseball caps, for example), chocolate or coffee. Check with our Client Liaison to see if our guide will be male or female so you can choose appropriately. Travel insurance is a good idea for those who may have to cancel a tour at the last minute (due to a potential family issue, for example) or for recovery of lost luggage or missed flights. Insure My Trip has a wide range of options, good customer service, an easy to navigate website. They offer numerous affordable options including travel, medical and evacuation insurance. Allianz is also a trusted name in the travel insurance world. They do not offer evacuation insurance but do provide travel insurance at affordable rates. A. Once you have paid a deposit, there is a cancellation fee if you cannot join us. The cancellation fee depends on the tour and how far in advance of the tour you cancel. Our refund policy is covered in our Booking Terms and Conditions and is also outlined on the Registration Form that you’ll receive within 24 hours of registering. Refunds will be sent by check within two weeks of us receiving written notification (email is fine) of your cancellation. If Beth is traveling when you cancel, it may take longer than two weeks to get your refund check out to you. She’ll mail it as soon as she can upon returning to the office.